It shouldn’t surprise anyone that with all the feverish activity being channeled into creating super-smart robots and cyborgs, someone wouldn’t have taken the initiative and whipped up a robotic dog. 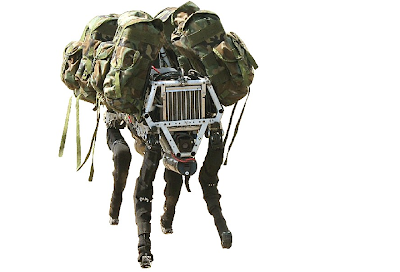 Dubbed BigDog and billed as “The Most Advanced Quadruped Robot On Earth,” Boston Dynamics synthetic K-9 can run at speeds of up to 4mph, climb 35 degree slopes, and hump a 340lb load. We should add that “hump” is USMC jargon for “carry” - we wouldn’t want anyone to suspect that we were implying that this formidable piece of ordinance was prone to getting ornery and taking liberty with some form of non-commissioned beast of burden.